Trump Negotiator: We intend to levy a tax of 35% on any shipment of goods made in China by U.S. companies for export to the United States. First, no goods or products from U.S. companies shall be sold in China unless the plant making such product is located in China, employing Chinese labor. Second, there shall not be levied any taxes for 10 years on U.S. companies employing more than 100 persons in China. Third, China will manufacture with German engineers and Italian designers a new electric sedan car, with a 400-mile charge, 100 miles per hour speed, acceleration to 60 MPH in six seconds, at a cost of $20,000 to be sold world-wide. Fourth, China will subsidize the full costs of research institutes in China in the areas of energy, material sciences, pharmacology, information technology, bio-tech, genetics, transport, and aeronautics. Fifth, China will embark on a multi-trillion dollar infrastructure program for schools, highways, railroads, ports, damns, power stations, under contracts only available for bidding by companies domiciled in countries which do not restrict the free flow of goods and services to or from China. Sixth, China will develop oil shale deposits in amounts sufficient to replace its reliance on oil or coal. Seventh, China will provide human, financial and material support to Iran to facilitate its nuclear development program. Eighth, China will provide material support to facilitate the stability and growth of North Korea. Ninth, China will invest its reserves in Euro-dollars, yen and other currencies, rather than U.S. dollars. Tenth, China will seek majority equity investments in U.S. companies at favorable prices for stockholders, with the purpose of moving plant and facilities to locations in China. Eleventh, China will withdraw all Chinese students in science and mathematics from enrollment in U.S. universities and endeavor to place such students in institutions of higher learning outside the U.S.
Twelfth, China will enter into bilateral and multi-lateral agreements with countries throughout the world that agree to open and free trade without tariffs, for the purpose of facilitating China’s export and import potential. That’s for starters. Your move. 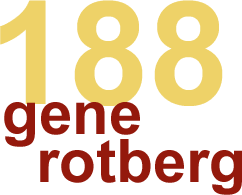 © 2018 Gene Rotberg. All rights reserved.